We are having, not intentionally I don't think, international dinners here at the ol' homestead. 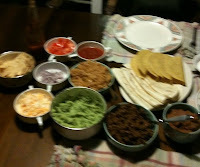 Last night it was falafel night and tonight it was a taco extravaganza. I consider both huge successes. However, tonight wins the How Many Plates, Bowls and Other Utensils Can Possibly Be Used at Once Award. I mean really, this seems a little bit ridiculous. Please note the fuzziness of the picture because my hands are still shaking from finding all the bowls, plates etc to use. This does not even include all the pots and pans necessary to create such a feast. 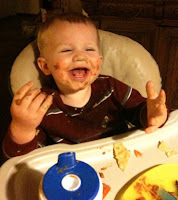 Despite this overuse of every single item in my kitchen, everyone really enjoyed dinner. Jeff took the entire process of creating tacos and eating them VERY seriously! 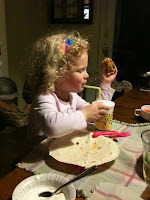 Lilly loved to construct her tacos. She made two, ate 1/2 of one. James, well he put beans all over his face. Good times were had by all! Until it was over. Cleanup was hell! There was also very sad news about my favorite actress of all time, Rue McClanahan. She had heart surgery at the end of 2009, and during her recovery she suffered a minor stroke. She is in a rehabilitation center and working on getting back to an active life. In the meantime, let's watch her work her magic! 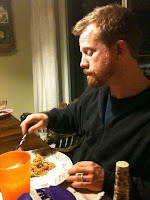 At the end of this light hearted look at our dinner rituals and Rue McClanahan, I want to once again state the obvious. Haiti is suffering. We MUST take time to pray, hope and contribute however we feel comfortable. Here are some links that will get your contributions to the country of Haiti. From my research, these organizations do their best to spend the money directly on needs, not on red tape and organizational costs. If you don't feel compelled to contribute to these organizations, please do your own research and find a way to help these families of Haiti. Unable to Aim Low, Weird.